Great and valuable 1Z0-070 exam dumps are the best tool for passing Oracle Exadata X5 Administration exam. Pass 1Z0-070 exam to earn Oracle Certified Expert, Oracle Exadata X5 Administrator certification demonstrates your mastery of a collection of skills including Exadata specific database administration, ASM administration, Network administration, and Linux administration. Just come for Oracle certification 1Z0-070 exam dumps to pass your exam successfully. 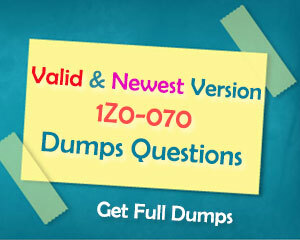 Test Free Dumps of 1Z0-070 Exam Dumps, we ensure that you can pass 1Z0-070 exam successfully. 1. Which two statements are true about the use of DBFS, ACFS, and external file systems and components in an X5 Database Machine environment? B. DBFS supports file system snapshots. C. ACFS supports file system snapshots. D. Storage Area Network (SAN) Cbased file systems may be accessed directly from the storage servers in a database machine. E. Oracle Sun ZFS Storage Appliance- based files are not automatically protected by Data Guard. 2. Which two are true about sparse griddisks and their use in disk groups on an X5 Exadata Database Machine? A. Sparse diskgroups must be created using sparse griddisks. B. Sparse diskgroups may be created using a combination of sparse and non-sparse griddisks. C. Sparse diskgroups may not be used for database snapshots. D. Additional space for a sparse griddisk is allocated as soon as newly written data is stored in the flashcache on a cell. E. The virtual size of a sparse griddisk may exceed the physical size of the space occupied by the griddisk. 3. You installed ASR Manager on a stand-alone server and configured Auto Service Request (ASR) for your X5 Database Machine and its assets. Which three statements are true about this configuration? A. Simple Network Management Protocol (SNMP) traps are used to send notifications from database servers to the ASR Manager. B. Simple Network Management Protocol (SNMP) traps are used to send notifications from storage servers to the ASR Manager. C. When a component fault occurs, fault telemetry is securely transmitted to Oracle via Simple Network Management Protocol (SNMP). E. Simple Network Management Protocol (SNMP) traps are used to send notifications from the Enterprise Manager to the ASR Manager. F. Simple Network Management Protocol (SNMP) traps received by ASR Manager are forwarded to the Enterprise Manager. 4. Which two statements are true about RMAN incremental level-1 backups for a database running on an X5 Database Machine? A. Block Change tracking (BCT) is not needed for databases in an X5 Database Machine, because ASM automatically does block change tracking when diskgroups are built from griddisks. B. cellsrv filters blocks and returns only those that have changed since the last backup, for databases in archivelog mode. C. cellsrv returns all blocks that have been or might have been changed since the last backup, and RMAN filters the blocks that do not require backup. D. cellsrv filters blocks and returns only those that have changed since the last backup, for databases in noarchivelog mode. E. Block Change Tracking (BCT) is not needed for databases in an X5 Database Machine, because change tracking is done by cellsrv. 5. Which three statements are true about Exadata storage server alerts in an X5 Database Machine? B. A threshold- based alert gets cleared automatically when the measured value no longer violates the threshold. C. A storage server alert is only ever issued as a warning or at a critical situation. D. Storage server alerts are all stateless alerts. E. Storage server alerts are all stateful alerts. 6. Which two statements are true about the X5 Exadata storage server rescue procedure? A. The rescue procedure can be executed from the CELLBOOT USB flash drive. B. An Exadata storage server automatically enters the rescue environment when it cannot boot from the system area. C. The rescue procedure can be used to repair corruption in an ASM diskgroup. D. The rescue procedure can be used to restore a corrupt system area. E. The rescue procedure must be used to recover from a failed Exadata storage server software upgrade. 7. Which two statements are true about backup performance when using Recovery Manager (RMAN) on an X5 Database Machine? A. Backups are fast because the Infiniband network is faster than fiber channel storage, so RMAN read I/O operations are faster than in traditional storage networks. B. Backups are fast, because physical I/Os operations are reduced by the use of the Storage Index by cellsrv. C. Backups are fast, because data blocks are read from the Database Flash Cache. D. Backups are fast, because all data blocks are read from the Exadata Smart Flash Cache. E. For incremental backups using Block Change Tracking, cellsrv filters blocks and returns only those that have changed since the last backup. 8. In which scenario will griddisks residing on the same celldisk have balanced performance characteristics in an X5 High Capacity Exadata Storage Server? 9. You are in the process of upgrading your X5 Database Machine half rack to a full rack. 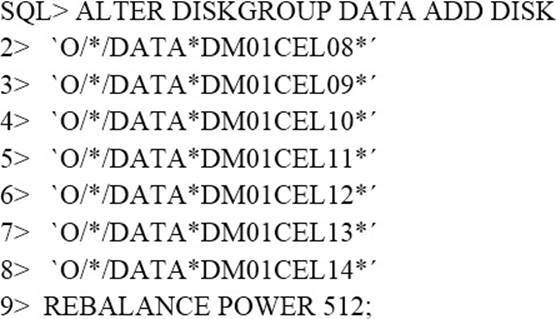 The new storage servers are called DM01CEL08 through DM01CEL14. How many failgroups if any, will be added to the DATA diskgroup by executing this SQL statement? 10. You plan to migrate an Oracle database that supports an online transaction processing (OLTP) workload to your X6 Database Machine. The Database Machine database version is 11.2. You plan to perform a physical database migration using Transportable Database. Which two are requirements for this method? B. The source database must be at least 11.1. C. The source database must be at least 11.2. D. The source database must use only bigfile tablespaces. E. The source database must be deployed on a Big Endian platform. F. The source database must not use bigfile tablespaces. 11. Which four statements are true concerning the configuration or use of Enterprise Manager Cloud Control to monitor and manage Exadata Database Machine components? A. Computer nodes forward their SNMP traps to the Management Server process on the same computer node. B. Storage nodes forward their SNMP traps to the Management Server process on the same storage node. C. Cloud control can monitor and manage a Database Machine compute node expansion rack. D. Oracle management agents must only be installed on one storage node in a Database Machine to enable monitoring and management of all storage nodes. E. Cloud Control cannot monitor partitioned Exadata Database Machine systems. F. Cloud Control can monitor and manage a Database Machine storage Expansion rack. G. Oracle management agents must only be installed on one compute node in a Database Machine to enable monitoring and management of all compute nodes and storage nodes. 12. Identify two supported modifications to an X5 Database Machine. 13. You are designing the monitoring architecture and procedures for an X5 Database Machine fabric consisting of two full racks, to provide for the monitoring for all components on the critical path of the admin network. Which two components need to be monitored? 14. Which two statements are true about Auto Service Request (ASR) with an X5 Database Machine? A. ASR Manager must be installed and configured on a dedicated server external to the Database Machine. B. Configuring ASR is mandatory for all Database Machine assets. C. ASR Manager opens a service request (SR) automatically after sensors detect hardware faults. D. ASR Manager must be installed and configured on one of the database servers. E. ASR can upload configuration metadata to support problem resolution. 15. Which two statements are true about data paths used during RMAN backup and restore operations when media management servers use InfiniBand to connect to an X5 Database Machine? A. During backups, data blocks are always read from Smart Flash Cache by cellsrv. B. During restores, data blocks read from the media are sent to a database server that sends the blocks to cellsrv to be written. C. During backups, data blocks are read by cellsrv and sent to a database server, which sends the blocks to the media manager to be written to media. D. During backups, data blocks are read by cellsrv and sent directly to the media manager to be written to media. E. During restores, data blocks read from the media are sent directly to cellsrv to be written. 16. Which two statements are true about the use of Intelligent Platform Management Interface (IPMI) on an X5 or X6 Database Machine? A. IPMI can be used for server configuration and management on each database server. D. IPMI can be used for server configuration and management on each storage server. 17. Which three are true concerning Exadata snapshot databases? A. They are supported on non-container databases. B. They are based on a read-write copy of an existing database. C. They are integrated with the Multitenant architecture. D. They can be created only on sparse ASM disk groups. E. They don’t support all Exadata features. F. They can be created on any type of ASM disk group. 18. In which three situations will a Smart Scan occur on a table for which Smart Scan is possible, assuming that nothing in the environment prevents a Smart Scan? A. The ASM diskgroup containing the table’s tablespace has a 4 MByte AU size. B. Executing queries in parallel. C. setting serial_direct_read= true in the session issuing the SQL statements and executing a serial query. D. Having direct path reads used at execution time. E. An update to the table is made identifying the row to be modified by primary key. F. An index range scan occurs for the table. 19. As part of planning for database consolidation, you grouped your databases into two categories based on different technical and business objectives. Which three statements are true about possible configurations for your Exadata X6 Database Machine fabric? A. The storage grid may be partitioned when deploying a single-rack Database Machine configuration using virtualization. B. The database grid may be partitioned when deploying a multirack Database Machine configuration. C. A single database cluster benefits from accessing multiple storage grids. D. Multiple database clusters may access the same storage grids. E. Multiple database clusters never benefit from accessing a single storage grid.